Can the retro-styled Olympus OM-D E-M5 beat the Fuji X-Pro1? It could be argued that 2012 will be the year of the compact system camera (CSC), with more and more appearing on the market and the sector growing in popularity. Pretty much all of the major camera manufacturers now offer a mirrorless model in their ranges, but two of the most interesting cameras to be announced in recent weeks are the Fuji X-Pro1 and the Olympus OM-D E-M5. Both are pretty serious investments, and seem to be aimed at top-end enthusiasts or pro photographers looking for a small and portable camera. Both also feature retro styling and great aesthetics, which should please a design-oriented crowd. But how do the specs of each camera stack up - on paper at least? Here, ahead of full reviews that will be here soon, we take a look at the vital statistics of each camera to see how they compare. Both the Fuji X-Pro1 and the Olympus OM-D E-M5 feature a 16 million pixel sensor, however the Fujifilm is a larger, APS-C sized offering. Fuji also claims that the X-Pro 1 X-Trans CMOS sensor can outperform even full-frame 35mm sensors. The OM-D E-M5 uses a micro four-thirds type sensor, which Olympus claims offers significantly better noise performance than on its PEN series of cameras, including the PEN E-P3. Although both sensors look pretty promising, if the Fuji X-Pro1 can indeed live up to its huge claims, then it seems obvious that it will also be the winner of this duo. Often a bugbear of many compact system camera users is the lack of a viewfinder through which to compose images. The Fuji X-Pro1 offers a hybrid viewfinder, which was first introduced in the Fuji X100 and includes both an optical and electronic finder (EVF). The Olympus OM-D E-M5, on the other hand, includes an integrated EVF, which is a first for its Micro Four Thirds cameras. Given the flexibility of having a dual viewfinder, it's the Fuji X-Pro1 that again takes the crown here. With both cameras claiming to produce low-noise images, you'd expect them to have an impressive ISO range. They don't disappoint, with the Fuji X-Pro1's standard range coming in at ISO 200 - 6400 and expandable up to ISO 12800 and 25600. The Olympus also has ISO capabilities of up to 25600, so in that respect the two cameras are pretty much tied. Olympus claims that when compared with the PEN, the OM-D E-M5 offers a 75% reduction in noise output. The noise levels of both cameras is something we'll be very keen to put to the test when we get them in for full reviews. The Fuji X-Pro1 offers a 3-inch, 920k dot LCD screen, while the Olympus OM-D E-M5 provides an OLED 610K dot version. Here the Olympus tips the balance, because its screen is a tilting touch sensitive unit. While some will argue that a hinge joint creates a weak point in the camera, it's also undeniably useful for shooting at awkward angles. Here, the cameras are once again tied, since they both offer Full HD 1080p video recording. The Olympus OM-D E-M5, however, also has the creative Live Echo mode. For street photographers who are likely to be out shooting with the camera for long stretches of time, battery life will be of paramount importance. When we used the Olympus PEN E-P3, we found that after a day of moderate use, the battery was drained. The Fuji X-Pro1 claims to offer 335 shots per battery charge, while the Olympus OM-D E-M5 promises ever so slightly fewer, at 330. However, it's worth noting that an optional OM-D battery grip is available, which almost doubles the battery life to around 650 shots. Olympus is well known for its variety of digital filters that are available on both its compact system cameras and other models. The OM-D E-M5 is no different, coming readily equipped with the same art filters as found on the E-P3, while also featuring a new Key Line filter. Meanwhile, the Fuji X-Pro1 offers several Film Simulation modes, which are said to recreate the look of classic film emulsions, such as VELVIA and PROVIA. It's hard to say which one of these offerings is better, since this is something that will ultimately be down to personal preference. While some of the art filters on the Olympus are fun to play with, some are a little superfluous, leaving you wondering who would use them. We'll be keen to see how well the Fuji X-Pro1 manages to deliver its Film Simulation, and we can see this appealing to many photographers. This is another factor that will probably be a personal preference, but both the Fuji and the Olympus have obviously gone down the retro route, Fuji even employs an aperture ring on the X-Pro 1's lenses. Given the long-standing heritage of both of these brands, it's interesting to see old fashioned-style cameras now becoming so fashionable, with users of the original Olympus OM film SLR perhaps being tempted by its digital reincarnation. Both the X-Pro 1 and the OM-D E-M5 weigh in at 450g, which for a compact system camera is fairly hefty, but should give a reassurance of quality. In terms of volume of lenses available, the Olympus wins hands-down here. Currently offering around 20 different lenses, not to mention Panasonic Micro Four Thirds lenses which it will also be compatible with, Olympus users should have plenty of choice. That said, the three lenses that are currently available for the X Pro 1 are all fixed length prime lenses which will undoubtedly appeal to professional photographers. It is also known that Fuji is planning more lenses in the near future. Neither of these cameras are cheap, let's be straight about that. These both represent a serious investment, coming in at over a grand each. However, the Fujifilm is significantly more expensive, currently showing a pre-order price of around £1,400 in the UK. 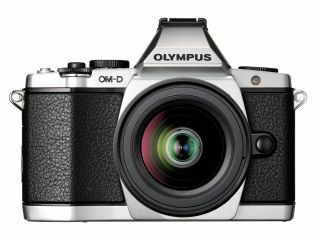 The Olympus, on the other hand, comes in at £1,149. Having to choose between these two cameras is incredibly difficult. Both have valid reasons for claiming to offer excellent picture quality from a body that also scores well in the looks department. Overall, though, we think the Fuji X-Pro1 will be the better performer of the two, mainly due to the - admittedly not yet tested - the larger sensor that Fuji claims can outperform a full-frame camera. However, that potential extra quality does come at a premium, pushing the camera into semi-pro DSLR pricing, which may be a little bit too much for some to bear. It will be interesting to see how these two cameras compete against each other in the market once they're finally available for sale, especially when it comes to marketing. Watch this space.